On Saturday night I had the pleasure of being the Dj and mobile disco provider in the VIP tent for the Fyvie Festival after show party. My day started in Dumfries at 7am and I had to travel to The Popinjay Hotel in Rosebank to remove the LED dance floor that I’d put down the day before as on the Saturday they had a wedding. I arrived there at 8.45am and cleaned and removed the dance floor so the tables could be put in position for the wedding that was starting after lunchtime. I soon had the white LED dance floor cleaned and put away on its trolley so it could be put back down at room turnaround. Once again I was back on the road and met Liam one of my Djs to give him a set of wireless mood lights. We always meet at Strathclyde Country Park as it’s easy for me as I’m passing up the M74. With that job done it was back to Edinburgh to The Place Hotel to pick up my giant love letters and then off to Fyvie Castle in Aberdeenshire. 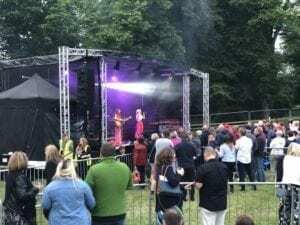 I got to Fyvie Castle at 4pm but wasn’t due to start until 11pm which gave me loads of time to set up and then watch some of the acts on the main stage. Fyvie Festival was really very good with loads of people there and lots of different styles of acts. My job was to set up my mobile disco in the VIP marquee for the after show party. 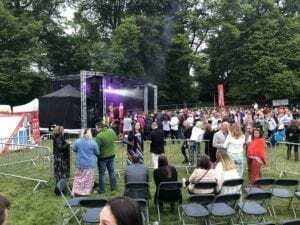 At around 7pm the main stage had its headline acts on and this was the time I was to set up my disco gear as most of the guests were outside watching the bands on stage. I set up my disco very quickly and had a bit of banter with one couple who were standing near the entrance door to the marquee. I’d just bought my new Yamaha DXS 18 subs a few days before and this was the venue to really hear them work properly. The main stage had a very expensive D & B sound system which sounded amazing and made me very jealous. 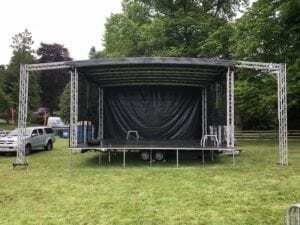 The main stage at Fyvie Festival. At 10pm a couple cane and asked me if I was the Dj and could they plug into my sound system. I said yes of course and helped them set up and they started at 11pm. They played a short 20 minute set as the festival was running late. At 11.20 I came on and played Erasure “a little respect” and the dance floor was jam packed! It stayed like that until 12.07 when I had to finish. I played a set of classic singalong, dance like crazy songs back to back and the audience went crazy. It was a very short but phenomenal night for me. 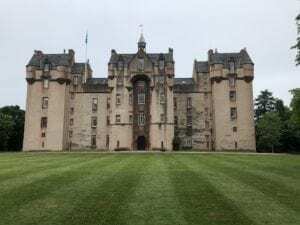 The one thing I forgot to say was about the drama I had when I got to Fyvie Castle. As I drive across the grass I heard a loud bang from the back of my van and I knew I had probably burst a leaf spring. I drove to where I had to park up to unload and went to have a look underneath my van. Sure enough the drivers side leaf spring at the back had broken just above the back axle. I knew I had to get this fixed and quickly as I had a gig the following day in Aberdeen at Westhill Scout Hut for Jake’s birthday party. I called Djrect Line breakdown service and they got green flag to contact me. As they couldn’t recover my van until the following day they arranged a hire car for me as no vans were available. I got a Nissan X trail which was just big enough to get my gear into. I was picked up by enterprise car hire and chatted to a lovely Polish girl called Paulina who looked after me and got all the paperwork done. I went to Jake’s birthday party as planned and had a great gig. I had something to eat at a Toby Carvery in Aberdeen and then drove to Perth. By this time I was really tired and my bed was calling. I slept extremely well and knew I’d pushed myself a little too far that week. I did an amazing wedding on Wednesday at Bearnock Lodge near Loch Ness, then driven to Dumfries, dropped off a set of love letters at Ingliston Country Club at Bishopton, then a dance floor outside Glasgow, then went to Edinburgh and then Workington in Cumbria. 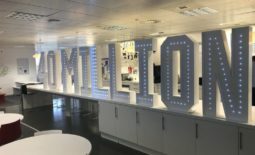 Friday was pick up the 4ft love letters that I dropped off at Ingliston Country Club on Thursday then drop off a set of 5ft tall love letters in Edinburgh, then drive to Workington in Cumbria. Saturday was pick up dance floor at The Popinjay Hotel in Rosebank then off to Strathclyde Country partk to drop off my mood lights to Liam, then off to Edinburgh to pick up the 5ft Love letters from The Place Hotel. After that up to Aberdeen and across to Fyvie Castle. Sunday was my kids disco at Westhill Scout hall and then a drive home to Perth before heading back on Monday to Dumfries. What a rock n Roll lifestyle I lead! Lol. A very tired but happy Ashley wrote this blog at 6am on Tuesday as my body just doesn’t know how to relax. It always makes me laugh when people say being a Dj is easy and we just play music. I hope that my blog posts really give you an insight as to just how hard mobile Djs work. Wedding at Bearnock Lodge Near Urquhart. Engagement Party British Legion Club Workington.